Happy Sunday! I didn't think I was able to create a card for this month's Penny Black and More midmonth reminder, but the kids had their friends over yesterday morning, so I was able to do some coloring and created this cute CAS card. Our theme this month is simply Anything Goes, so no reason not to play along. The only restriction we have that no digis are to be used. 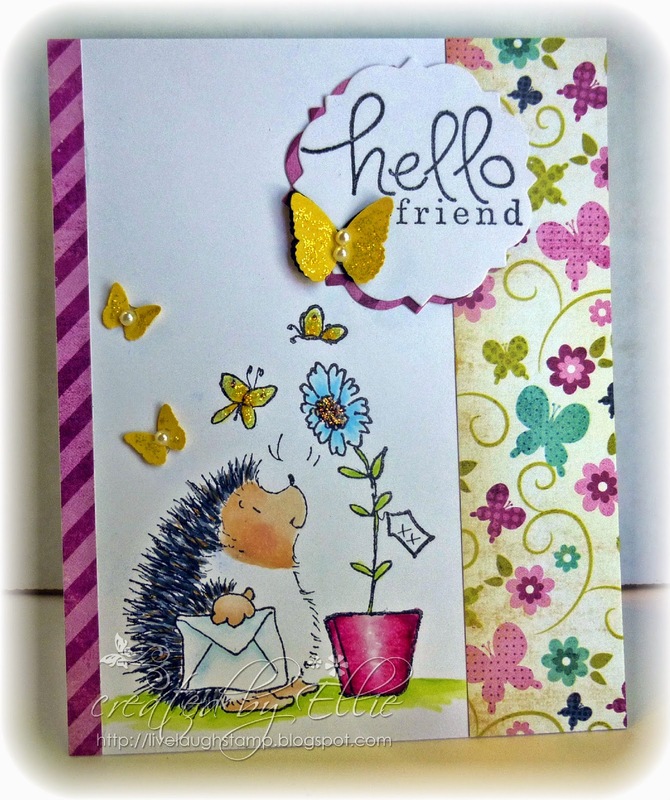 The stamps are from the clear set "Hello Friend" by Penny Black. The image has been stamped onto copic xpress blending card and then colored using copic markers. 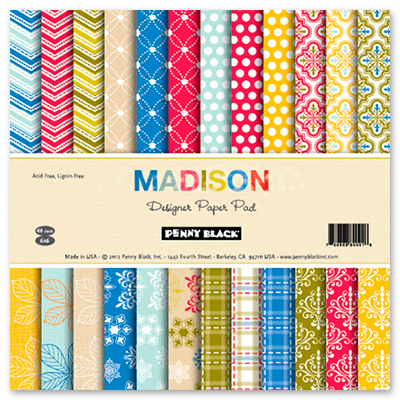 Designer papers are from a 6x6 paper pack which I bought a couple years ago. Sorry I don't remember which company it's from. The sentiment is part of the clear set. 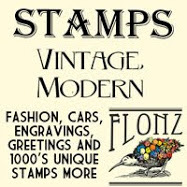 I used Whimsy Stamps Notables 7 die to cut it out. Embellished with a few extra butterflies (MS punch), some sticky pearls and glitter. If you haven't played along yet with us at Penny Black and More, or if you'd like to play again (you can enter up to 3 times), simply click this link to view the challenge. There is still a little time left to play. As usual we have several fabulous sponors! I have included a picture of all prizes. So there are 6 chances to win something! I've fallen in love with this card Ellie. I love the layout and the colours are my favourites. So inspiring for me I may need to case this sometime. A lovely sunny happy card Ellie. aww, cute card ellie! 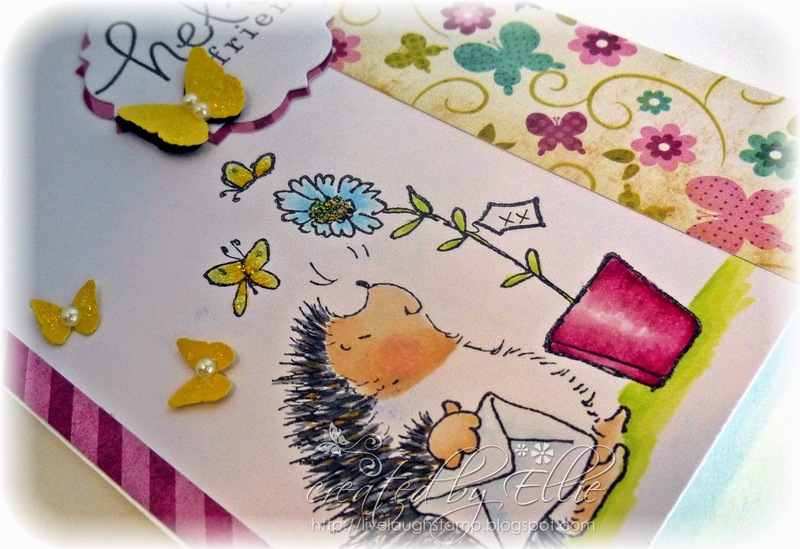 adorable hedgie, beautifully coloured and i love the extra butterflies and oh so pretty papers! Lovely summer card. Thanks for joining us at Crafty Creations. So adorable! Love all the flowers, butterflies, and sparkle. FYI -- I really don't know what the silk pants I featured on my last Fashion Over Fifty post are called. I just call them Pajama Pants because they look and feel like silk pajamas…but yes, they are quite a step up from what Walmart shoppers wear. LOL! ooh so bright and cheery, love the paper you put with it. What a lovely project. Great colors. Thanks for playing at Crafting at the Weekend. We hope to see you next challenge. Good luck. Thanks for playing at the Crafty Little Fairies!